I never thought that I would ever stay at a Ice Hotel. I only see them on TV, and they're always in far away places, like Sweden, Iceland, etc. But man, did I get a suprise! Browsing through the weekly TravelZoo Top 20 e-mail, towards the bottom of the list was a special offer by the Ice Hotel - Quebec, Canada. Woah! I was so amazed, and I could NOT let this chance pass by! 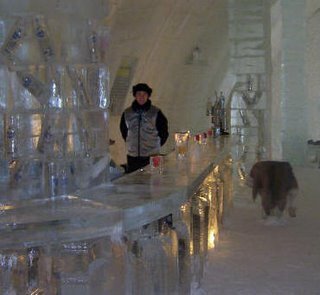 So I booked one night @ the Ice Hotel for me and Romy during spring break. This hotel is rebuilt every year during November-December, opens in January, and melts back down in late April. It is made purely out of about 11,000 tons of snow and 350 tons of ice. Inside it is decorated by artists, so each room is unique. Oh yeah, and all the furniture (including the beds) is made out of ICE!!! This picture is of the ICE Bar, where they serve shots of Absolut vodka in carved out ice shot glasses. Of course, we'll write more after we survive to tell about it!